Classic Italian Almond Olive Oil Cake turned into a decadent chocolate dessert. Served with a sinfully good brown butter almond glaze. Quick and easy to make. And the big secret is that it is gluten-free! Whisk together the cocoa powder and boiling water in a measuring cup until the cocoa powder is fully dissolved. Add the vanilla. It should be thickish like a thin paste. Set aside to cool. In another bowl, mix almond meal, baking soda and salt. In the Kitchenaid bowl, start to slowly beat the sugar, olive oil, and eggs, and then turn to medium high for 3 minutes. Reduce the speed to low, and add the cooled cocoa mixture. Slowly add the almond meal mixture and beat for 1 more minute until fully combined. Brush a 8-inch springform pan with olive oil. Pour the batter into the pan. Bake in a pre-heated oven for 50 - 60 minutes. When it is done, the sides will be set, and the center will look slightly damp. Another way to tell if the cake is done is to wiggle the pan. If the center jiggles, it is too wet. It should look loose and damp but not jiggle. Take out and let cool.The cake will continue to cook when it is out of the oven. While the butter cools, whisk the powdered sugar with the cream in a medium bowl. Whisk until completely smooth but thick. Slowly whisk in the cooled brown butter until smooth. Mix in the lemon juice. Stir in the toasted almonds. Spread glaze onto the top of the cake letting it drip down the sides. The cake can be served warm or at room temperature. 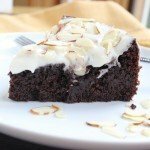 The Chocolate Almond Olive Oil cake recipe is from TV cook Nigella Lawson. The Brown Butter Almond Glaze is courtesy of Pastry Chef Gina DePalma.